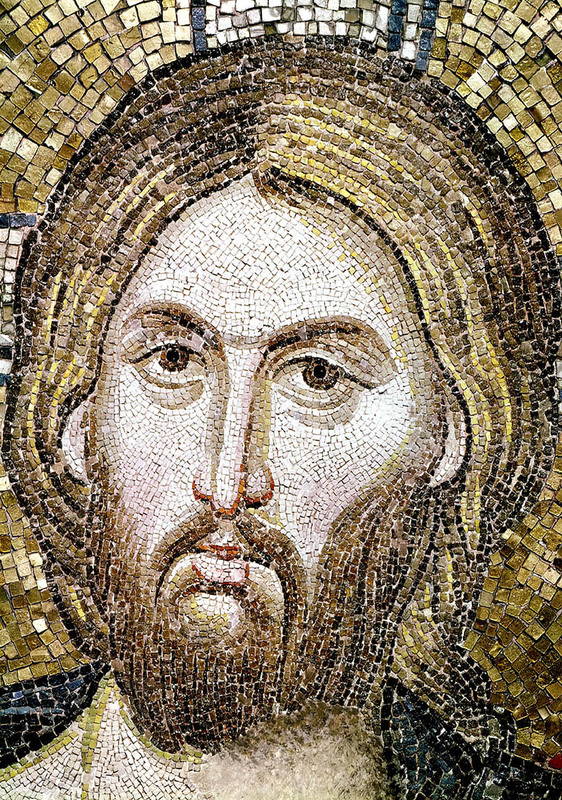 This image of Christ is carries the inscription Hyperagathos - "Supremely Loving" - of humanity. Here Christ extends his hand outwards in blessing. Standing in the chapel and looking at the icon he appears that Christ's hand extends into the real space of the sanctuary above the viewer. Around the image of Christ is an inscription saying that the nun Martha offers this chapel in honor of her husband as a 'pledge of salvation". 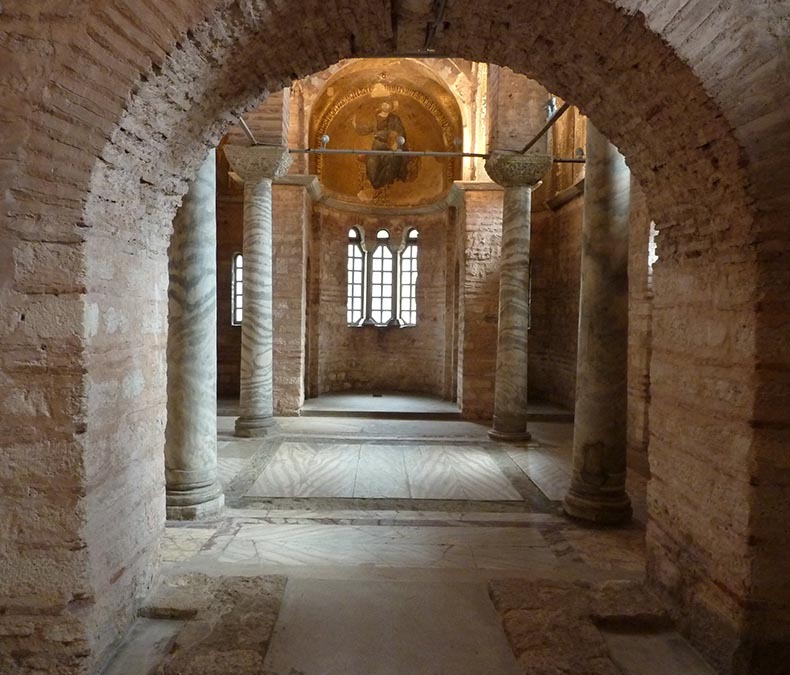 The former Byzantine Church of the Theotokos Pammakaristos - or "All Blessed Mother of God" - has been called Fethiye Djami since its conversion into a mosque. It is located in the northwest corner of the city of Istanbul. The original church was built during the Comnenian dynasty, probably during the reign of Alexios I, by John Comnenos and his wife Anna Doukaina (not Anna Dassalena, wife of Alexis I). There was an inscription (now lost) in the main church mentioning them so the church has been dated to 1065. The church was always an Imperial monastery and many members of the Palaiologan dynasty were buried in it. The image above gives a wonderful impression of the human scale and intimacy of the chapel. What has changed is the polychrome marble revetment on the walls is gone, the vaults are missing their gold mosaic and there was originally a screen across the front (you can see the marks in the floor. There would also have been a small marble iconostasis with icons dividing the tiny sanctuary from the nave. The great mosaic portraits of Maria-Martha and her husband, which would have adorned the chapel, have vanished, too. 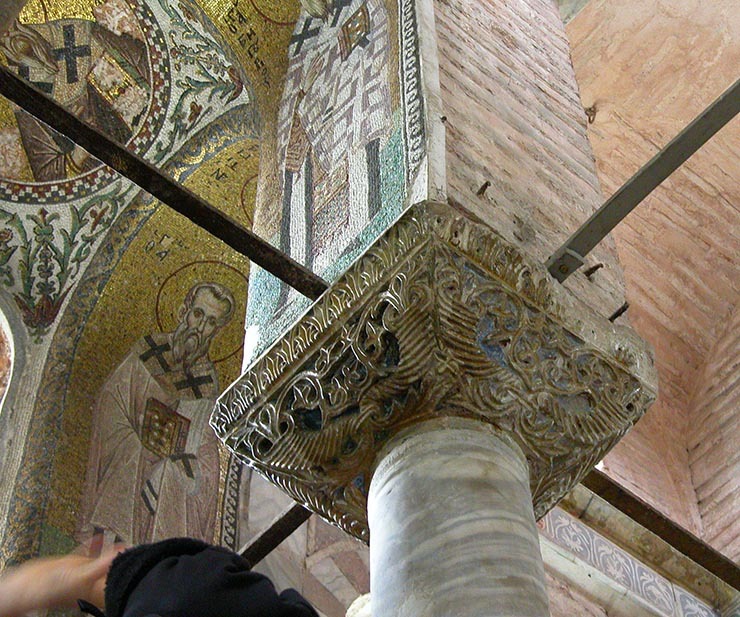 A parekklesion - built in the cross-in-square technique - was added to the church by the Maria Brana Doukaina Palaeologina to the right side of the church in honor of her husband Michael Glabas Tarchaneiotes in the early fourteenth century. He lived from around 1325 and died around 1310. 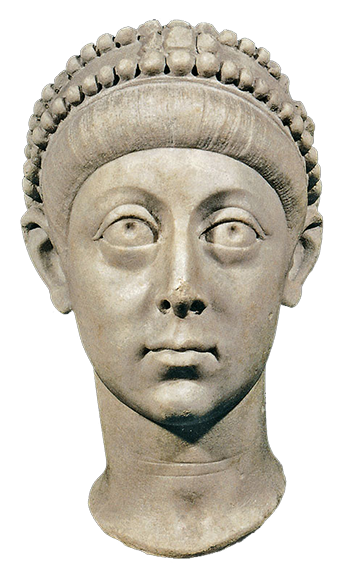 Michael took over responsibility for the monastery in 1263, just two years after the retaking of the city by Michael VII Palaeologius in 1261. The man he appointed to run the monastery, a monk named Cosmas, was elected Patriarch less than a year later, in 1294. Michael had obtained one of the highest of court ranks, that of Protostrator. He definitely had died by I315, when another man, John Philes Palaeologus, was appointed Protostrator. Michael also had a special devotion to St. Euthymios, whose chapel he restored and painted next to St. Demetrios in Thessaloniki. Michael probably became a monk in his last days, having suddenly left military service due to illness. After her husband's death Maria took the veil and became a nun, taking the name of Martha. She did not enter religious life at the Pammakaristos, which was a men's monastery, but at the Convent of the Virgin of the Sure Hope where her sister also took holy orders later. Michael's tomb was placed in the an arcosolium in the north wall. The uncovering of the mosaics was completed in 1962 and comprise 41 scenes. All of the saints in the church are nearly life-sized, which is not apparent from photographs. All of the saints shown are in an intercession prayer - a great Deesis - orchestrated through the chapel. It is believed to be the work of one single artist, who would have had help laying the plaster setting beds. 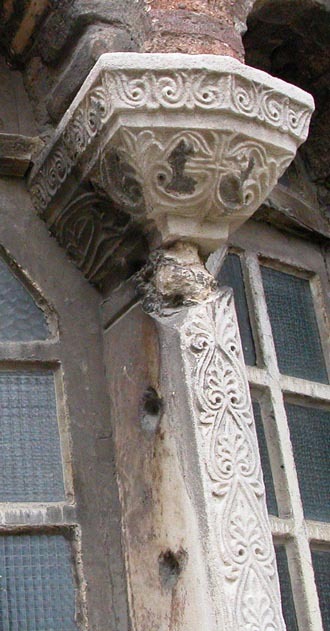 Some parts of the marble revetment of the chapel have survived and they are topped by a delightful marble frieze ornamented in the champleve technique, which circles the building. The frieze is inlaid with black pitch (which has faded to a dull blue-gray in most places) and a red substance. It shows vines, round medallions and heart-shaped shields containing rampant red lions and other fanciful animals including paired birds. 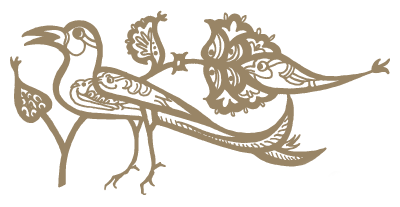 It is thought the lions are a family crest associated with the Glabas family. Combined with massive Proconnesian marble slabs, the chapel had inlaid Cosmatesque pavement borders, a fragment of which is preserved in the northeast corner. Fragments of the carved fourteenth century marble templon - iconostasis mentioned earlier - were found in the church, are now in the Hagia Sophia Museum. 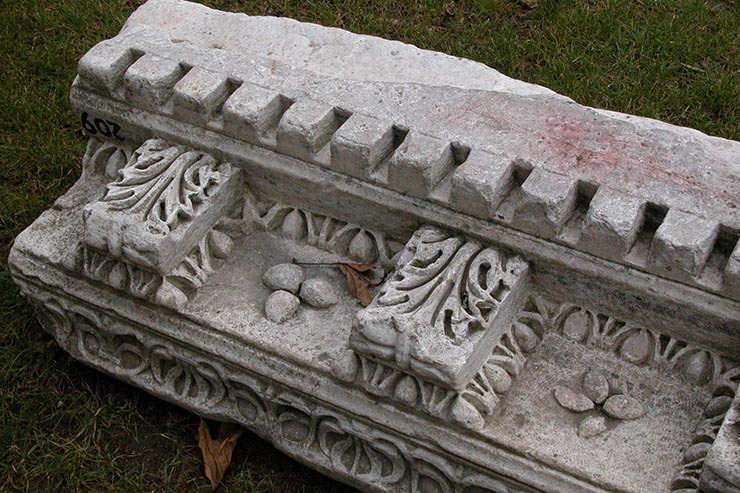 Fragments of a marble arch decorated with busts of saints was also been found here. This may have come from the tomb of Michael Glabas. The marble cornice of the dome is carved with crosses and rosettes. It was painted blue and the raised carving was covered with red bole and gilded. The crosses were left white. Christ appears alone in the conch because the chapel was dedicated to Him. The image of Christ stands in a kind of 3-D Deesis, with Mary the Theotokos on the bema wall to the left and John the Baptist on the right, interceding for humankind high-up - in the air - across the sanctuary. This image shows what it would have looked like in natural lighting. Yes, there are small lights on a few of the cornices. Remnants of an inscription were uncovered in gold letters on a blue background which had been painted on the cornice which encircles the chapel. This inscription was difficult to conserve because it was painted upon a single layer of thin gesso applied to the marble cornice; the ancient paint layer tended to flake off during restoration. It is in iambic trimeters. The verses, by Manuel Philes, are an invocation to God addressed to Christ the Word, for the repose of the soul of Maria's husband, the Protostrator Michael Glabas Tarchaniotes. The poem continues on an exterior cornice of the north side of the facade of the chapel. Glabas died around 1304 and was buried in the parekklesion. In the cross-vault above the sanctuary are the four Archangels, Michael, Gabriel, Uriel and Raphael. 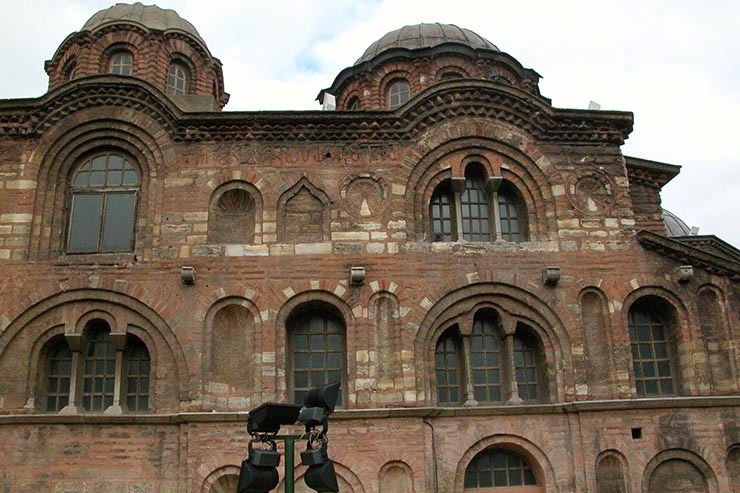 During the fall of Constantinople to the Ottoman Turks in the 1453 the great cathedral church of Constantinople and seat of the Orthodoxy, Hagia Sophia, was seized by force of arms - amidst the incredible slaughter and bloodshed of tens of thousands of innocents who took refuge there - and converted into a mosque. Those who were not killed were sold into slavery or paid ransoms for their lives. All of the women - regardless of age - were raped over and over again. This same fate fell to many of the young men and boys. The church was converted by Mehmet II himself who called a halt to the slaughter as he climbed on top of the great altar and recited the Muslim prayer of Shahada. 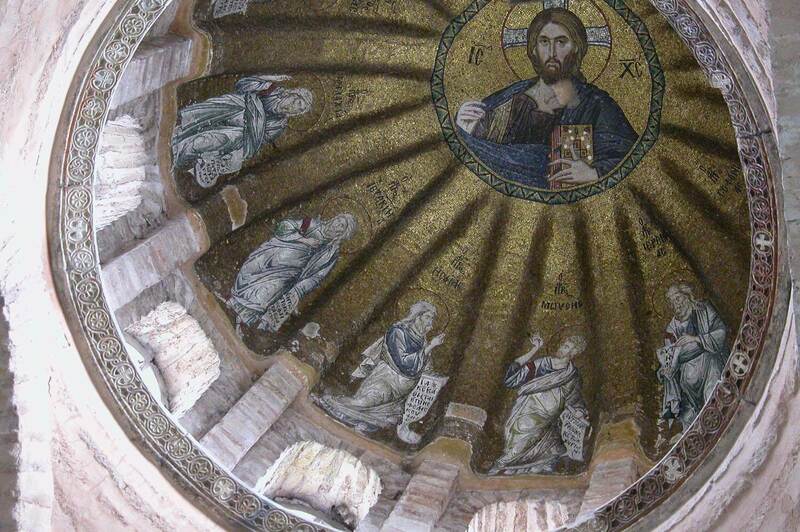 Thus 'converting' Hagia Sophia, legally and spiritually, to Islam. Today the church has gigantic plaques and inscriptions depicting this prayer as symbols of the triumph of Islam over Christianity. The conqueror Mehmed II found the anti-Unionist monk Gennadios in his cell at the Pantokrator Monastery and, much to his surprise and shock, elevated him to the Patriarchal throne, presenting him personally with his pastoral staff. After a short residence in Justinian's church of the Holy Apostles, in 1455 the Patriarch Gennadios was forced to surrender this cathedral and moved to the Pammakaristos. 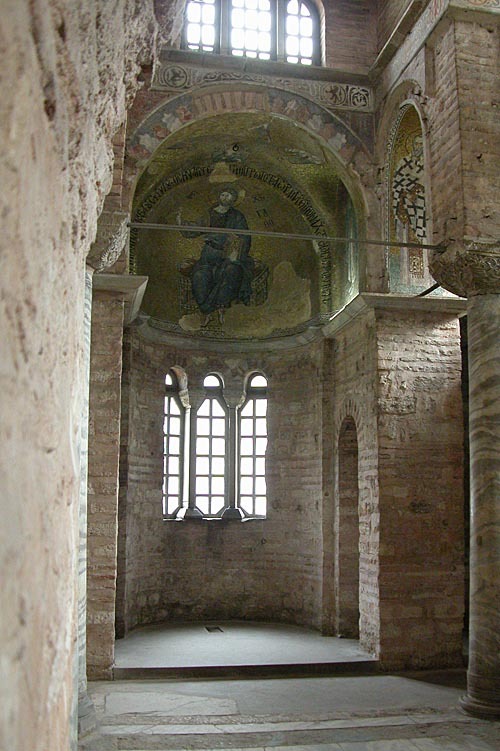 The Sultan Mehmed II visited the church and sat in this chapel to converse with the Patriarch Gennadios, who must have lived in great fear and awe of him. 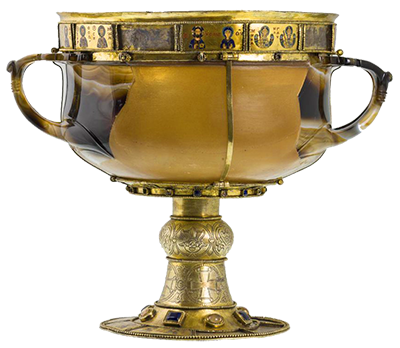 In the following years relics, works of art, liturgical vessels and even the remains of former Emperors and Empresses of Byzantium were gathered together at the Pammakaristos as churches were closing or being demolished throughout the city. 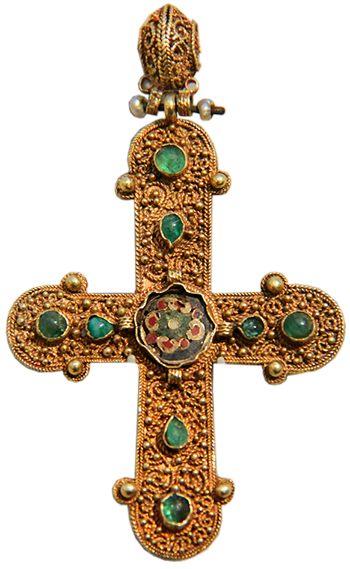 In 1488 the Chief Treasurer of the Sultan, Iskander bey, who lived near the church, seized the portable treasures of the Pammakaristos and all the money left by the recently deceased Patriarch Symeon I to the church - a great fortune totalling 180,000 aspers. In 1518 the church was restored. Structural problems with the dome required urgent repairs and money - 100,000 aspers - was raised from the Orthodox Hospodar of Wallachia for this purpose. From the time of the conquest the Christians who remained in Constantinople were under constant threat. They remained a significant minority in the city - as high as 40% of the population - that was an important source of taxation and extortion by powerful officials of the Sultan's court. At the same time the churches that remained in Christian hands were under constant threat by Muslim religious zealots and they fell, one by one, converted into mosques. In 1538 Turkish scholars decided that, since Constantinople had taken by assault, according to Islamic law no Christian churches should be allowed to remain in the city. A firman was issued to that effect and the Patriarch Jeremias I got wind of the Sultan's degree through a secret source. The Patriarch prayed to the icon of the Virgin Pammakaristos (this mosaic icon still exists in the Phanar today) in the church to deliver the Christians and their few remaining churches in the city from this looming disaster. He then went to the Grand Vizier Tulfi Pasa for help. The Grand Vizier told the Patriarch to make the case to the Sultan than Constantine XI had actually capitulated to Mehmet II. He was able to produce two elderly witnesses - 84 years after the fall - who had been in the siege of the city and were willing to testify under oath that they had seen the surrender with their own eyes. 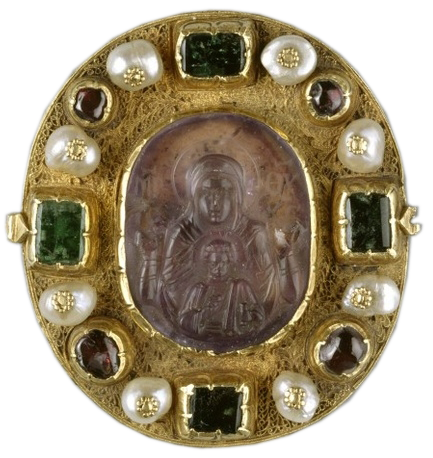 The Sultan Suleyman accepted this testimony (one can imagine the bribes that must have been paid), cancelled the firman he had issued and created a new one guaranteeing the inviolability of the Greek churches at Constantinople, and this firman was stored in the Savior chapel of the Pammakaristos. What was gained with so much effort was soon lost. In 1584, less than 50 years later, a new Sultan decided once more that all the Christian churches left in the city should be converted to mosques, but this step was - this time - prevented by the invention of the Aga of the Janissaries. 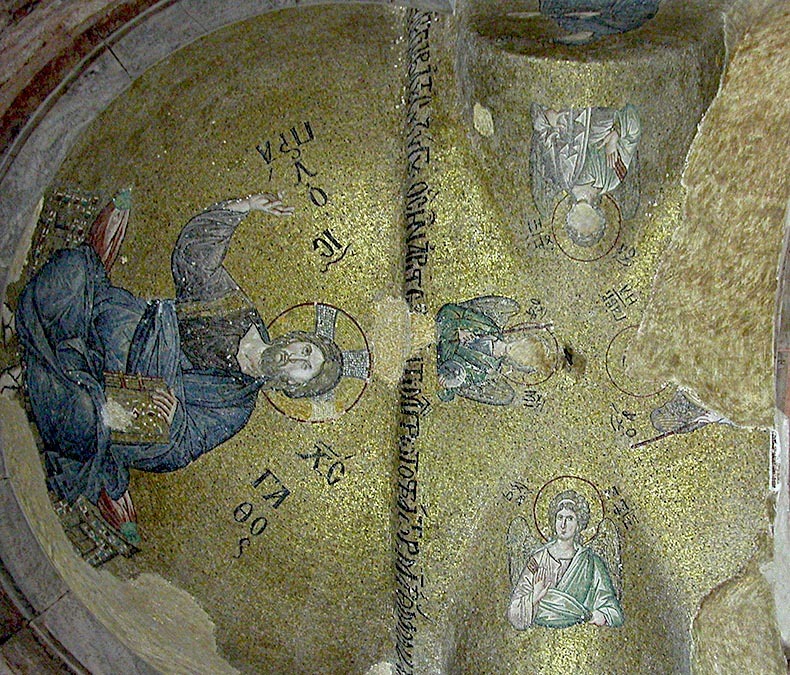 The illegitimate Patriarch Pachomios II removed from under the church dome of the Pammakaristos four columns of precious marble and a part of the marble revetment of the church and sent them as a present to his protector at court, a certain Mehmed aga who was attached to the service of the Sultan's mother. In desperation he tried to sell the silver vessels and all the relics remaining in the church to the Venetians - all to no avail. The church was seized by Sultan Murad III in 1587 and converted into a mosque to celebrate his conquest of Azerbaijan. It was taken away from the Christians on the pretext that the Pammakaristos had been given by Mehmed II on a personal basis, without any assuarnce that it would be passed on to his heirs on the Patriarchal throne, hence the property belonged to the Sultan to do as he pleased. Thereupon the Turks entered the premises and recited their prayers there. It followed that the Pammakaristos was confiscated in August 1587. It should be noted that this period was one of religious intolerance for minorities in the West as well as in the Ottoman Empire. 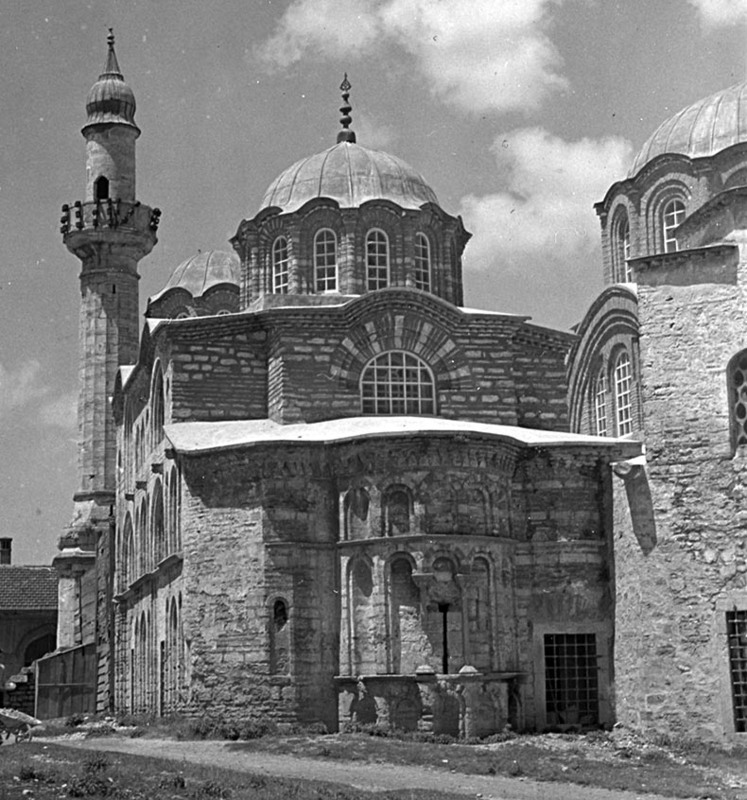 The central sanctuary was structurally altered by the Turks. Thomas Matthews, in his book Byzantine Churches of Istanbul, writes about this: "The triple arcades which originally separated the square nave from the ambulatories on three sides were removed and broad pointed arches were substituted; the three apses were destroyed and in their place a domed square room was placed obliquely against the eastern end of the building; fenestration was revised and the walls and piers were hewn back or remade to provide maximum openness of space in the building. The end result makes the original design difficult to recognize or appreciate." The Turks removed the two marble columns on the north side of the parakklesion and inserted a wide arch there. During the restoration of 1963 the arch was removed, the original struction here was restored in brick and columns cast in concrete that matched the appearance the original richly veined columns of Proconnesian marble that remained on the south side. The capitals of these columns were carved in the fourteenth century and were gilded on red bole with a blue ground (the columns of Hagia Sophia were also gilded in this same way in the eleventh) and much of this decoration still survives. Two mosaic icons from the church, one of the Hodegetria and the other of John the Baptist, were removed from the church and survive. There was a great fire in June 1784 - in the resulting repairs the mosaics of the main church were scraped down and those of the chapel were plastered over. However, the dome of the chapel was never concealed and was visible in the 19th century. 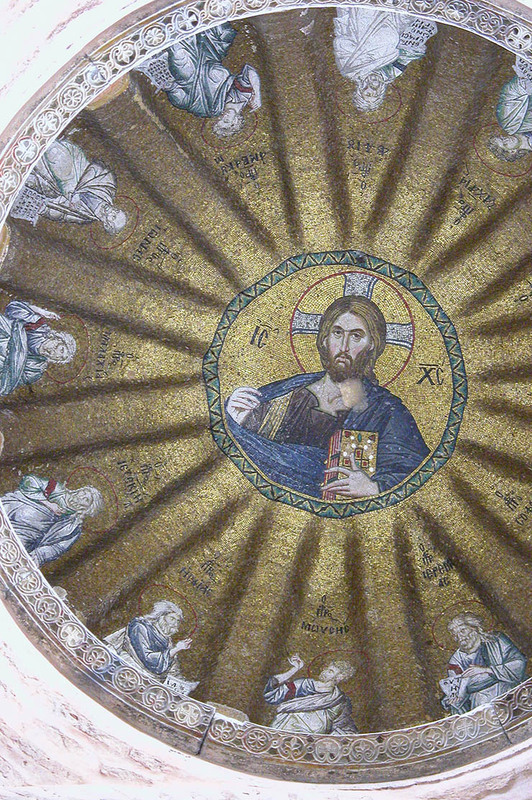 The decoration of the dome consists of a medallion of the Pantokrator at the summit and of twelve prophets in the calottes around Him. This constitutes the most impressive iconographical unit in the nave. The drum of the dome, pierced by twelve fairly large windows, provides no suitable surfaces for decoration; it was thus left with only a layer of plain gold ground which has largely disappeared. 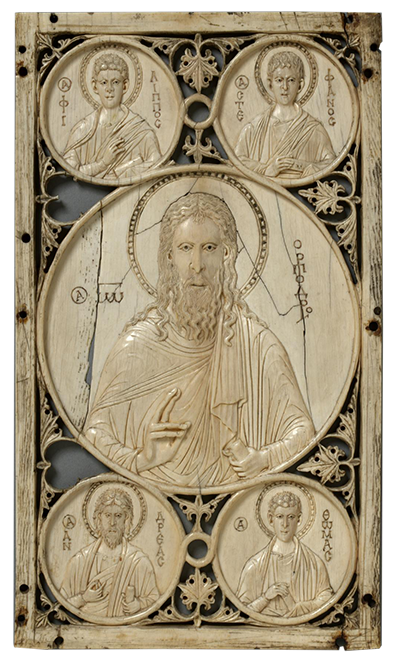 The pendentives have been stripped of their original decoration which probably consisted of the four Evangelists. 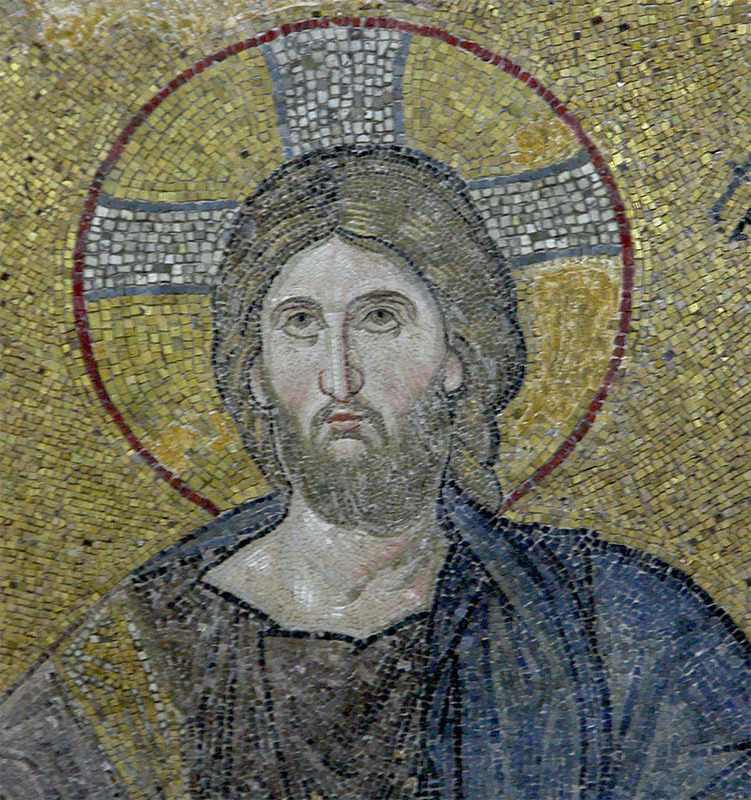 There is a close iconographical affinity with the corresponding figure in the south dome of the inner narthex of the Chora Church, now called the Kariye Djami, The expression of the face here is rather more severe when compared with the more humanized Christs of the Palaeologan period. 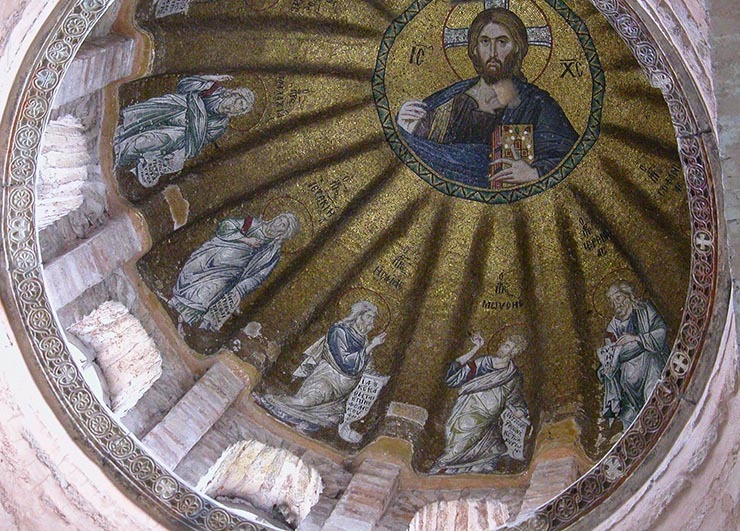 The composition of the Deesis in the apse consists of Christ - again here Hyperagathos - "Supremely Loving" of humanity - with the Theotokos on the left side of the bema and John the Baptist on the right. To the general theme of the Deesis has been added four busts of archangels in the vault above them. They represent Michael, Gabriel, Raphael and Uriel. The image of Christ shows him extending His hand out in blessing. 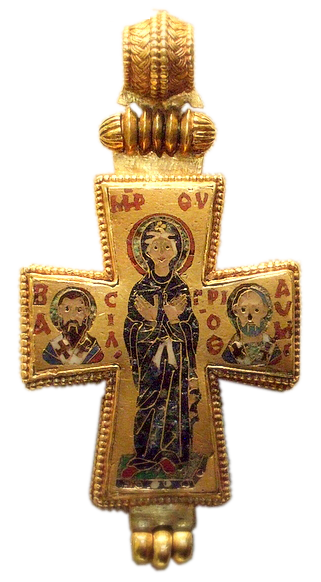 This iconographic type occurred quite suddenly in the late eleventh century under the Emperor Michael IV Ducas and has been associated with his decoration of the Church of Saints Cosmas and Damian. The epithet Hyperagathos - "Supremely Loving" of humanity - has not been found on any other image of Christ and is not recorded in the Hermeneia of Dionysios of Fourna, a sixteenth century authority on icon painting. 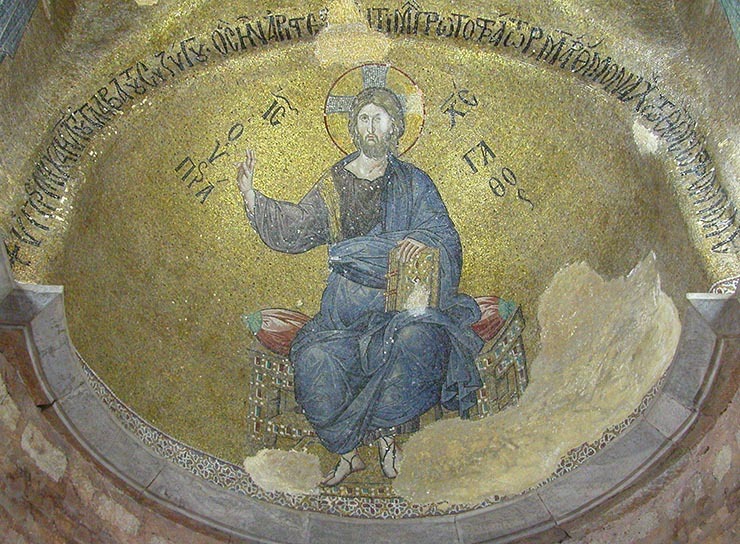 This Deesis image of Christ and its inscription appears to be unique and therefore was a specific choice by Maria.Note that the Virgin is standing on a jeweled footstool, setting her above John the Baptist who stands across the bema from her. This image of John the Baptist is noted for the fact the feet remained in the underpaint with only the highlights set in white mosaic. There is another painting in the church, St. Metrophanes in the south wall of the Prothesis, that is entirely in fresco.There are different explanations for this. One, that the artist was too lazy to finish it, or two that he was saving on mosaic cubes, either way believing that no one would ever see it. The colors of the robes of the Pantokrator are a stunning, rich blue and are expertly modeled. The face is realistically portrayed and there is damage to one of the eyes. The parekklesion was dedicated to the Savior. 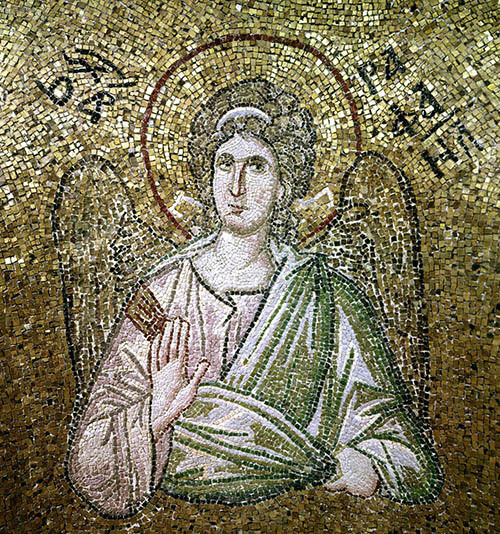 The mosaics cannot be firmly dated through historical sources, but must date from around 1310, so they are contemporary with those of the Chora Church. 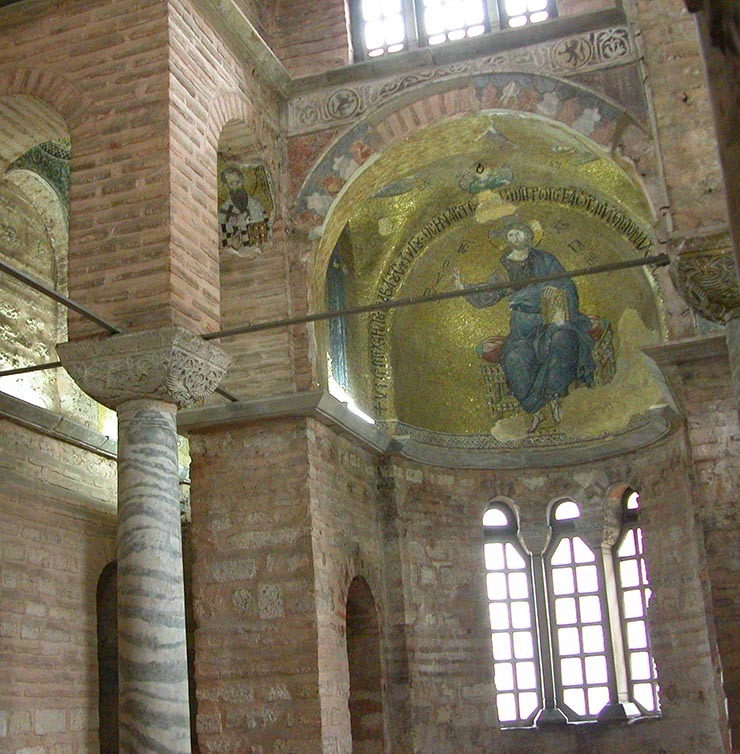 The Mosaics and Frescoes of St. Mary Pammakaristos by Hans Belting, Cyril Mango and Doula Mouri was the source for most of the information in this article. I am an icon painter, Russian Historian and Austin Web Designer formerly of Seattle, Washington and now living in Austin, Texas. 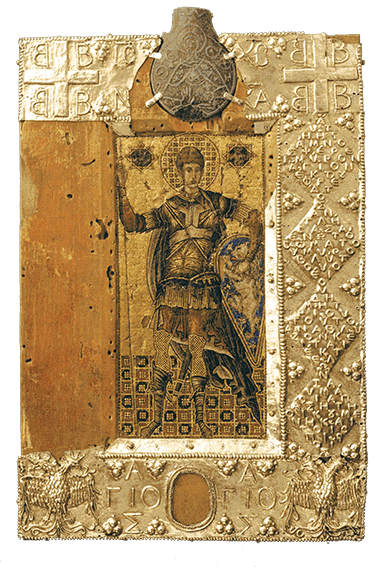 My interest in Byzantium and icons began when I was 8 years old and read my first book on Byzantium called "The Fall of Constantinople".